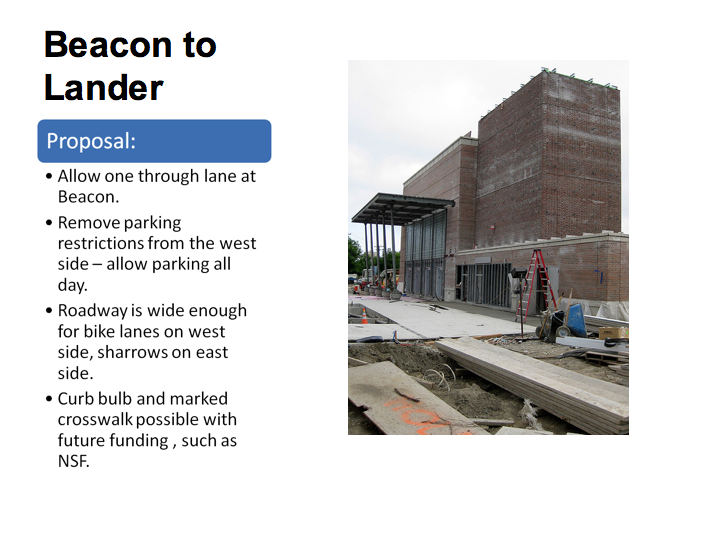 At the July North Beacon Hill Council meeting, Judith Edwards invited Brian Dougherty of the Seattle Department of Transportation to present SDOT’s possible improvements to the 15th Avenue South corridor from Beacon Avenue south to Spokane Street and on to Columbian Way. Neighbors along this corridor were specially invited to attend and share their views and opinions about what’s wrong and what’s right about traffic there, and to weigh-in on the potential improvements. Q: What’s the difference between a bike lane and a sharrow? A: Sharrows for wider areas of roadway that are not wide enough for a dedicated lane, or for downhill stretches where bikes are expected to maintain vehicle speed. 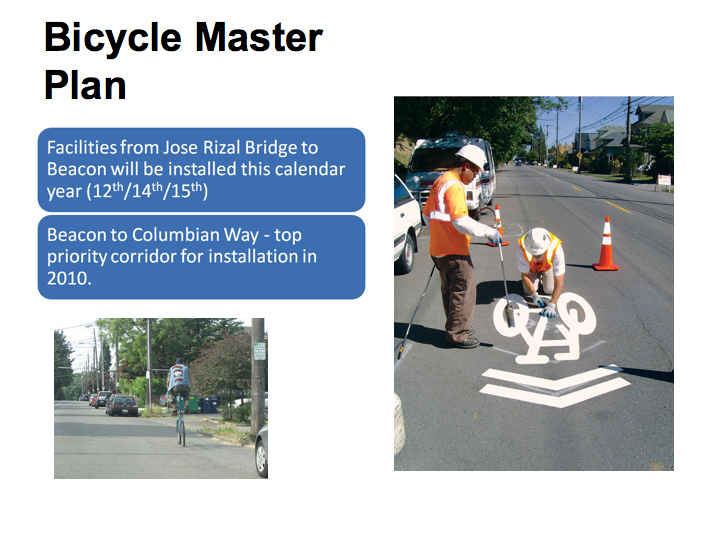 The changes are largely driven by the bicycle master plan which prioritzed routes along 15th Avenue South & 12th Avenue South from Jose Rizal Park to Columbian Way. 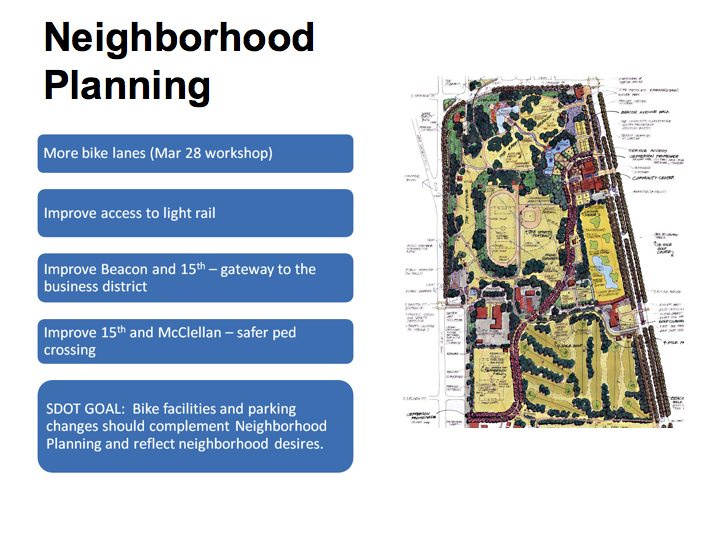 The changes for bike facilities are planned for this year. 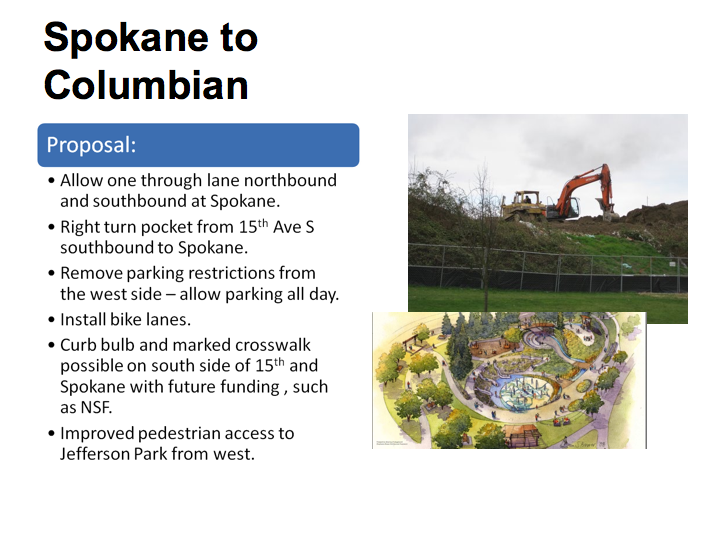 Markings and traffic changes can be installed with relative ease with current configuration from Jose Rizal Park to Beacon Avenue. 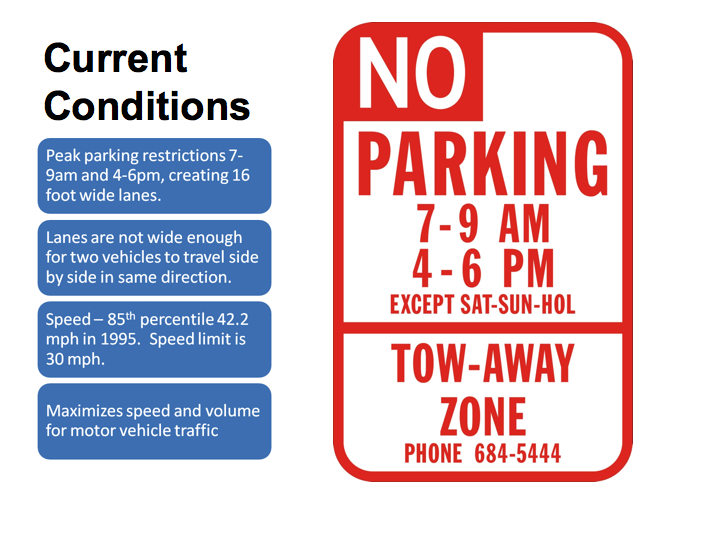 At Beacon, peak parking restrictions (7-9am, 4-6pm) cause problems for bike facilities. Neither bike lanes or sharrows work in current configuration. 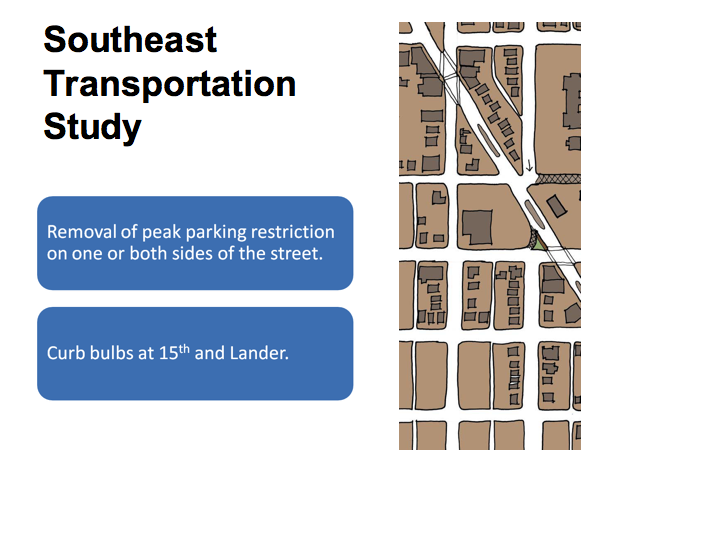 Almost unanimously, the neighbors along 15th felt that traffic runs too fast for the street, and when combined with the parking situation and lack of well-marked and signalled crossings makes it very dangerous for pedestrians and cyclists. 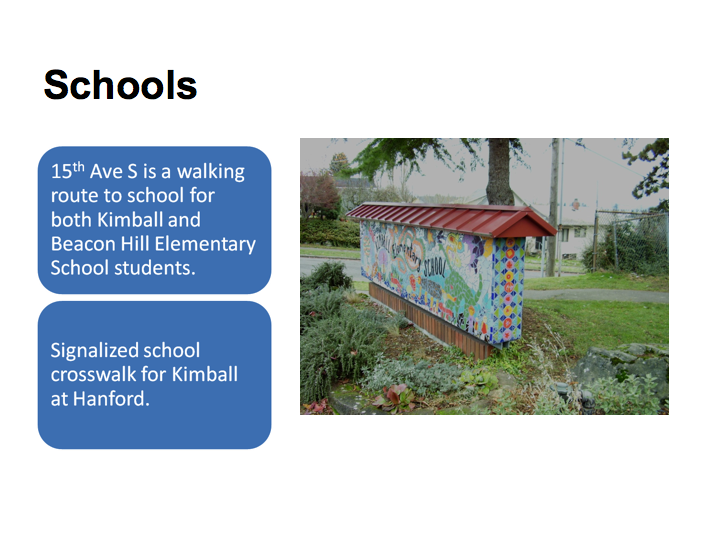 The slides of the presentation are below. 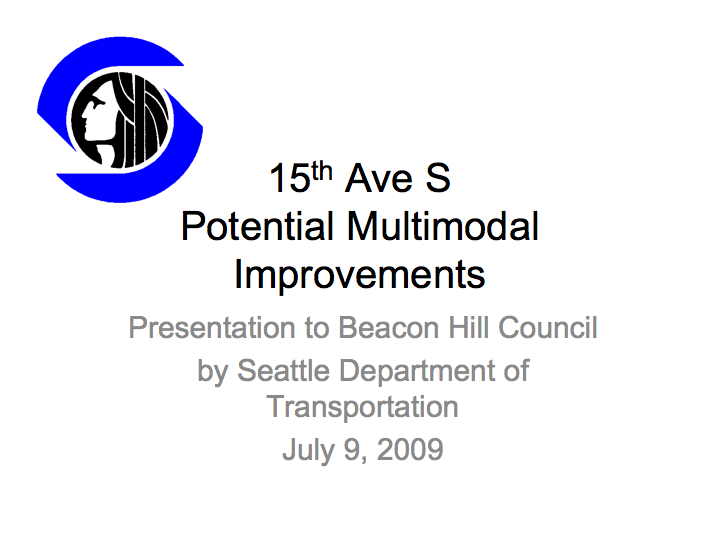 If you’d like to share your thoughts with SDOT on possible traffic flow or parking improvements, you can email Brian at brian.dougherty@seattle.gov. Click for the rest of the slideshow. 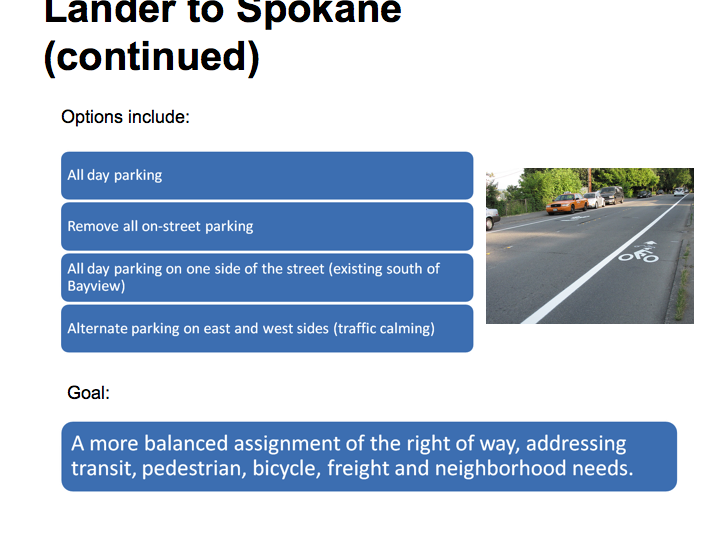 How about condemning the three or four houses on the NW corner of Spokane and 15th, and putting in a real turn lane? OR closing Spokane between 15th and Columbian, and routing traffic a block south, so that awful hill is no longer a major intersection? The 15th Ave South bike upgrades are underway. The re-striping north of College has started and you can see where the bike lane and sharrow stripes will be. The center yellow has already been moved. 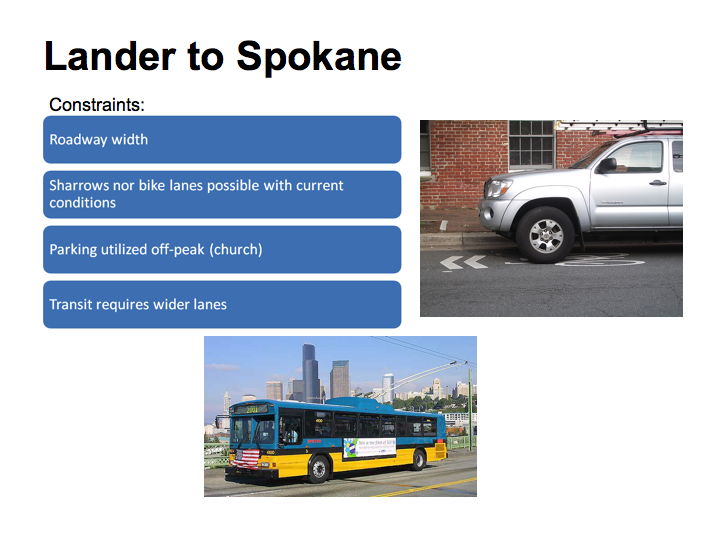 Also, when Mr. Dougherty was at the NBHC meeting last month, he said one proposal for 15th and Spokane was to stripe it to have a designated right turn lane when heading south on 15th. This would shift the center line and narrow the northbound lane at the intersection. 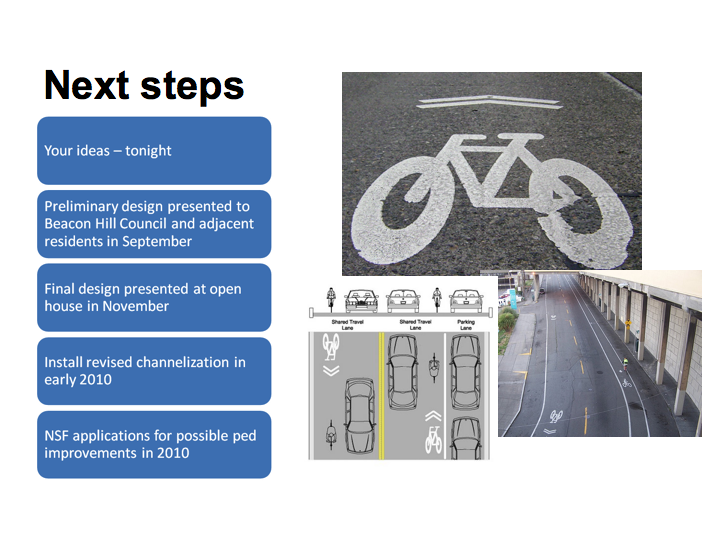 There is no plan on the table for changing the road in any way other than striping and possible signal changes or additions, that is, SDOT will not be widening 15th South. I really hope they do this. It is a bit uncomfortable in that intersection now — it needs a right turn lane.